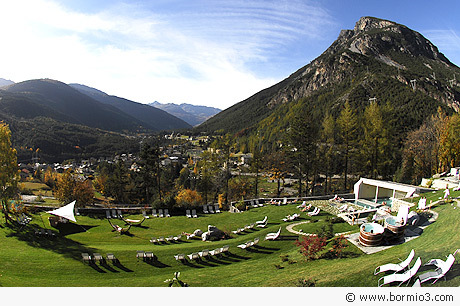 The Bagni di Bormio Spas resort consists of the Bagni Nuovi Grand hotel and the Bagni Vecchi hotel. The thermal complex at the Bagni Nuovi lies in its own monumental park at just five minutes driving distance from Bormio town centre. The Bagni Nuovi grand hotel was opened in 1836 and was completely refurnished in 2004. Thanks to this general makeover, the grand hotel was returned to its old splendour. Today the structure is a modern wellness centre divided into 5 sectors with more than 30 different services. The variety of wellness and beauty treatments make this a unique spa completely surrounded by mountain nature with can be enjoyed from the outside pools. Recently other 3 services have been added to the already wide offer of the Bagni Nuovi Spa: Baita di Pan, Sauna di Pan and vasca delle Naiadi. Since February 2009, these new services can be enjoyed together with the other 70 thermal services already available. In the splendid Gardens of Venus – the outside green area of the Bagni Nuovi, you can dive into the Naiadi pool for an energizing swim or post-sauna relaxation. This spacious pool can be accessed directly from the hut. Fed by thermal waters at a temperature of 30° C. this pool is a bit milder than the other pools where temperature goes from 37° C. to 43° C.
Just above the pool you find the Baita di Pan, a wooden chalet furnished in mountain style. The relaxation room is warmed by a big fireplace. Inside the chalet you will aslso find the sauna of Pan characterised by traditional winter sport objects hanging from the walls. The spacious pool is particularly striking and cosy at night time thanks to the reflections of light into water. Beauty farm and spas in Italy. The Bagni Nuovi Bormio spa. The Bagni Nuovi Bormio monumental park. The Bagni Vecchi Bormio spa.